I decided to go this route when I just tipped the scales at 1.1TB of music. My external and internal HD are full and still have much more to add. But need some advice. Does the NAS, like the Synology 412+ (I'm looking at this one) need a high end PC? 1. I have an older Laptop that I did a fresh install of Windows Vista 64 bit and ITunes. Nothing else but lossless music. 2. iTunes is my current platform for play back and for ripping. The NAS is connected via the network. The performance of your pc won't make a different to how the NAS performs over all. For the iTunes bit, may want to do some research on having itunes library on a network share. Last I heard iTunes didn't support it very well and had some problems with doing this. NAS is really interesting. More I read more you can do. Setting up is easy but finding the right software for audio and good sound quality is at best, done by trial and error. I like the idea of streaming via ethernet than wireless especially to a DAC. To bad PS Audios bridge will not play gapless and seems to have many issues. For now USB is in until networked bridges are more main stream. I do think in time this will surpass USB. Is that FLAC format? How many CD's? Seems like a TON of music. Seems like a TON of music. i have two old desktops with dual core AMDs that are around 2006. i'll try that freenas. i have to take out the GPU(atiradeon3870) and just use the on board graphics. thanks man. Yes it is a lot of music. About a year ago I stopped by my local library and found their music area. Not bad selection. Since is\t is a county library we have roughly 15 or more branches. I went online to their site and they have 1000's and 1000's of cd's. Mostly jazz, classical and rock. Thus my collection has doubled in one year. The best is once in a while you come across a SACD and RE-Mastered CD's. Can't beat the price either, Free! Plus they have a descent amount of DVD and some blue rays. As for the NAS just read the Drobo name and read more on it. Very simple system but not many apps for it compared to the Synology. Good to know about the apps comparison between the Drobo and the Synology. Re: synology - what is the price point for just the chassis? Or do you have to buy the chassis/ disk bundle? What do you plan to buy/ how much disk, and what is the price point if you don't mind me asking? The NAS doesn't require any other computer since it has it's own CPU and own OS. I think mine is a dual core 1GHz PPC chip. Anyway if anyone has questions about it, I can try to help. Praz Did you setup Raid 1. As for the Plex have you looked at the Roku. Read somewhere those two work very well together. There is not doubt I will end up adding video as I go. oh San Mateo, born and raised in Santa Cruz. Lots of family still live in the bay area. S.F. & Woodside. Hey VCoak - I actually set up what's called 'SHR', which is a combination of RAID 1 + RAID 5. So using 4 x 3TB 7200rpm disks, I can use 9TB. The other 3 TB is for redundancy. So far it's been rock solid. 2.5TB of movies and 527GB of music (mostly FLAC). As for Plex, I find that I haven't been using it that much since I installed it. I'm still trying to figure out what it can do that the Synology Media Server can't. I should probably mess w/ it some more. Yeah - I'm actually in San Ramon now (east bay). Alot of my family is here too, though we're from VA originally. What do mean it doesn't need any other computer? I'm looking at NAS and I thought it connected to my PC. I need to look at something other than using my hard drive. As such, it doesn't need to be physically connected to your computer. Obviously you want to be able to access it in a number of ways: copy files to and from any computer on your home network, play songs or movies off of it directly from your computer, stream stuff, etc. So you connect it to your router so all devices at home can see it. You can set up shared folders within the NAS that can be accessed by whoever's on the network (you can create accounts / restrict access to some folders, etc). 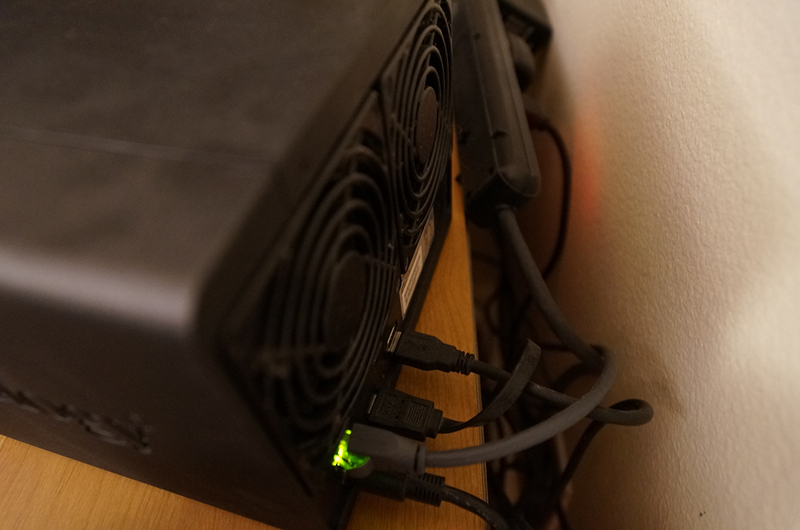 You can also connect other external hard disks to the NAS's USB or eSATA ports to expand storage or access stuff on them from the NAS. Hell you can even connect a USB DAC to one of the USB ports and play your music directly from the NAS b/c at least mine recognizes the DACs. 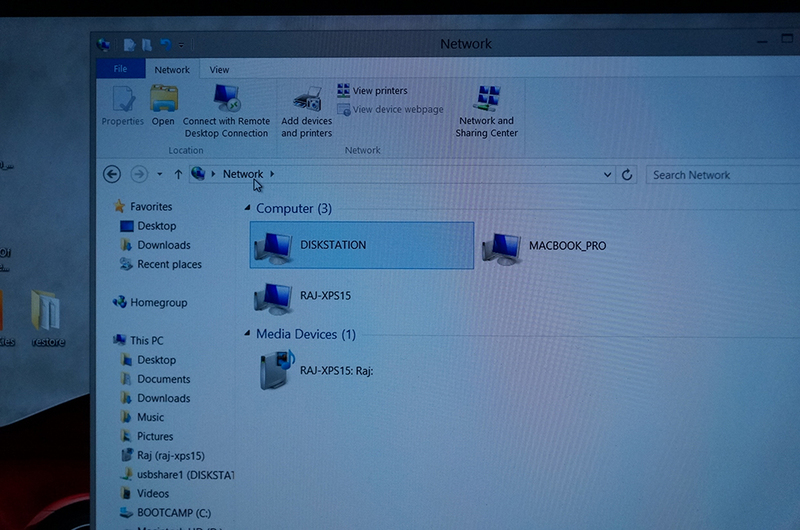 So on my Windows PCs, under 'Network Places', I see a computer called 'Diskstation'; that's the NAS. 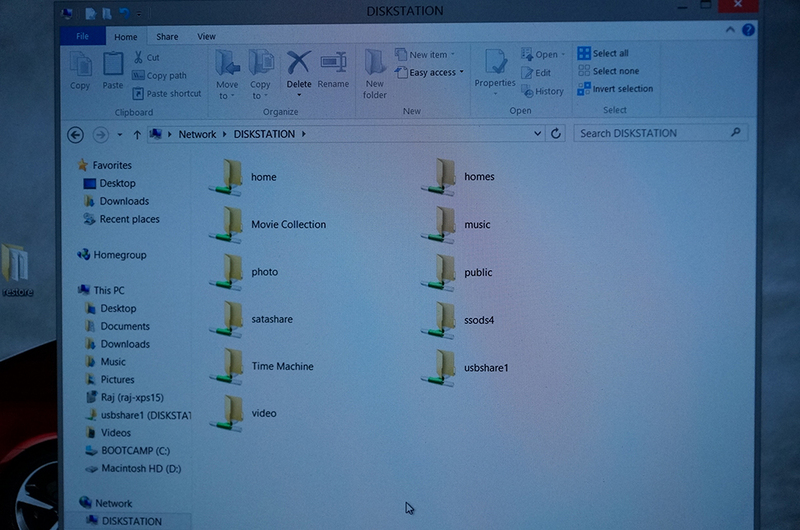 All the shared folders are visible there and I can access them like a hard disk that's on my own computer. Similarly, on my Macbook Pro, I can say Go-> Connect to Server, and type in 'Diskstation' or the local IP (192.168.0.25) and I can do the same thing. I'm doing some reading up on the synology but you have explained it better than the last couple hrs of my reading. I guess I see these as hard rives/ backup but I see they are not. Haven't quite grasped the concept completely yet. My PC? So I don't have a screen other than the PC. I expect my JRIVER on my my ipad will see the NAS and I control from that. 1 - Buy another large external HDD; say 4TB which should last you for a while. But that is all it is - a USB hard disk. 2 - Buy a NAS, which depending on the model can hold 1, 2, 4, 8, etc. disks of your choosing. Option 1 is the simplest and it will let you do what you want to do - add more storage so you can put your music, etc. on it. Then you can fire up JRiver and just play music from your laptop to your sound system, like you've been doing. When you want to share files with other computers at home, you simply turn on Windows file sharing. When you want to stream music to a squeezebox, you simply install Logitech Media Server and the squeezeboxes on your wifi network see the music and can play it. Option 2 is like having another computer with a much bigger hard disk. How do you interface with it? Well, instead of connecting it to your laptop with a USB cable, it's connected to your router with an ethernet cable. How do you get to it now? Pretty much the same way you did before. In JRiver, you just set your Library to that folder on the NAS and it works like it did when you had an external HDD. The advantage here is, if you have another computer connected to a different stereo in another room, you would just point JRiver on that computer to the same network folder. ie. It's on the network, so everyone at home can get to it. Some NAS's are pretty simple. A colleague at work was looking at a Western Digital one, it looks much less complicated than the Synology ones. 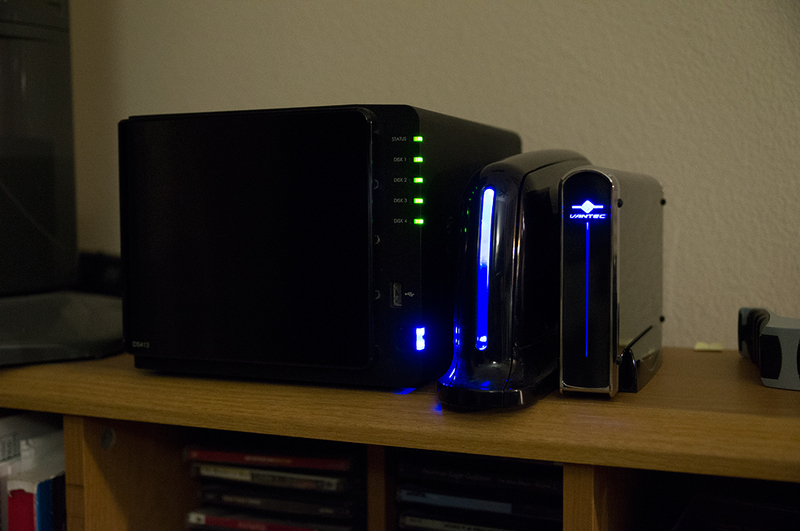 But the Synology ones let you do so much more, which is why I went that route (plus I'm a closet computer geek). The other thing to consider is that if your interface with the NAS is your home network, it may be much slower copying files to and from it if you're in a wireless N connection. My house has ethernet ports in every room, so most of our computers and network gizmos are hardwired - especially the NAS. And I just upgraded to wireless AC routers (gigabit wifi), so for me interacting with the NAS is as fast as if it were connected directly to any of those computers or devices. So the question is - do you want or need any of this stuff? You just plug this into your computer w/ the USB. It would basically give you a bigger USB hard disk than you currently get with the single disk ones available in stores. Hope all this helps clear things up a bit! Here are some pics of the NAS just for the heck of it. P.S. With respect to your point about the JRiver remote on iPad; it would work the way it works now. It'll control the JRiver on your computer. It won't connect the NAS, because your computer is already seeing the music on the NAS. Thanks for the great detail Praz. All making sense to me now and I like the idea of the NAS using RAID 1. I have my eye on the Synology 214play.I would put 2 x 3TB drives in this. I have the EA4500 router with a switch so I only hard wire with ethernet to the SB touch,oppo,avr,etc. Looks like the 214play has a 1gb instead of the std 512 for media server use. Thanks very much for the lessons. One more thing while I have your brain,when I upgraded my computer last fall I left my old one on the network but have one problem. I added a 3TB HD to it a year or so ago.Everything works fine when's on the old one but working from the new one thru the network I cannot see the drive anywhere. A neighbor helped me and set it up as drive A. Must have missed something in setup so the network sees it? Excellent - since you're hard-wired as well, the NAS will be perfect for you. The DS214play looks like a good one; it has a dual core CPU w/ the higher 1GB of RAM (like my DS413). Plus it has the USB 2&3 ports, eSATA port, and an SD Card reader - which is nice. It looks like it has all the same software as my DS413, so you'll be in good shape. I think it's a good choice! Don't i want 7200RPM drives? I see some are 5900 and then the standard old 5400. One last thing,will i be able to go from the USB straight to DAC with this? Since that option is still set up on the old computer, whenever you connect the 3TB disk to it, your new computer will again be able to see it. Basically you need to turn on the same option when the 3TB drive is connected to the new computer. - By default, everyone has read permissions; ie everyone on the network can access your files but not make any changes or delete anything. - If you know it's only you who's going to be accessing this stuff, you can click the 'Full Control' checkbox, so that normal read/write access is enabled. - Now go back to your older computer or some other computer and your drive should show up on the network. If it does, right click it and choose 'Map Network Drive'. Choose a drive letter to map it to (I usually pick something at the end of the alphabet), and hit finish. One other tip I find helps minimize issues with computers finding each other on the LAN is to set the network WorkGroup to the same thing for all computers; ex. I make them all 'MSHOME', which is usually the default. I will see what i can do with this and let you know-Thanks!!! !